Mark your calendars, the day of the Frosé is over. We’re in a Friesling world now. Here’s how to make one. 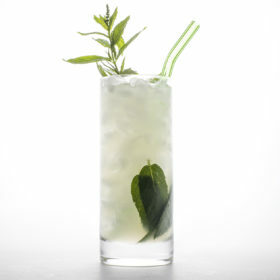 Bartenders, being creatures populated in large part by struggling writers, actors and comedians desperately seeking a creative outlet, are notorious for the quirky, pun-filled names they give their cocktail creations. But sometimes it works the other way around—a punny name deserves to have a cocktail created around it. Such it was when I received an email from our spirits editor, Kara Newman, earlier this summer with one word in it: Friesling. She knew then what I am only beginning to understand, that we are in a new era of drinks where norms once held paramount have been transcended. What we once thought true has turned to naught but dust in the wind. “Frosé” is now a thing of the past, a novelty to be left on the ash heap of cocktail history. We are in a new time, one in which some brave soul, some hero, has uttered the word Friesling, and we, as a people, can never go back to what we were before. So we invented our own recipe. Here’s how to make it. Pour all ingredients except garnish into blender with 1 heaping cup ice. Blend until smooth, adding extra ice if thicker consistency is desired. Pour into wine glass and garnish with half grapefruit wheel. Note: If pamplemousse cannot be found, substitute ½ ounce ruby red grapefruit juice and adjust simple syrup to taste.